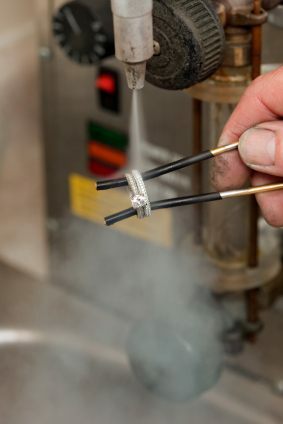 A jeweler is holding a diamond wedding ring in a stream of steam from a commercial steam cleaning system. This is the typical quick cleaning service found in most jewelry stores. Diamonds are forever, and your diamond engagement ring is expected to last as long as your wedded life with your future spouse would. However, general wear and tear, as well as some circumstances beyond your control, can wreak havoc on this precious piece of symbolic jewelry over time. How can you take care of your cherished diamond engagement ring and keep it sparkling and brilliant? Here are five tried-and-tested tips you can follow. It’s okay to remove it when doing manual labor. Many engaged women have the unfortunate tendency to keep their diamond rings on every minute of the day, even while doing vigorous tasks with their hands. Washing dishes, cleaning house, and doing other chores can really scratch and chip even the toughest metal and setting of a ring. Many household cleaners containing bleach and other harsh chemicals can also discolor a ring and weaken it. While it understandably holds much sentimental value and special significance, a diamond engagement ring should be removed whenever you need to do something that could potentially cause damage to it. Invest in a fabric-lined jewelry box for your ring. Beyond sentimental reasons, it’s a good idea to keep the box your wedding ring came in for safekeeping, as well as to protect it from dust and other elements when you do chores using your hands. Avoid putting your ring in a generic box along with other jewelry, as the stones and metal can scratch each other. Your diamond ring should have its own compartment and a “niche” to fit snugly into so it doesn’t get scuffed by hard objects. Take it off when bathing and moisturizing. There is already enough oil on your hands to tarnish your ring and make your precious stone lackluster. Keeping it on while bathing, moisturizing your hands, or using other grooming products can further aggravate the situation. Always take off your ring whenever you have to do these things, and keep it in a fabric-lined box. Have a trusted jeweler do a maintenance check for it every year. Let’s face it: precious stones and precious metals need precious care. Get your diamond ring checked by a reputable jeweler at least once a year. They can check if the stone is loose, if the mountings need to be strengthened, and if there are scratches and dents that need repairing which are not easily apparent. Maintenance checking can keep your precious engagement ring sparkling, strong, and beautiful for longer. You can either buy a jewelry cleaning kit, or else use a soft clean rag, and some mild dishwashing liquid and water to keep your diamond engagement ring dazzling and looking brand-new. Mix a small amount of water with a couple of drops of dishwashing liquid in a bowl, and simply soak your diamond ring in the mixture for a couple of minutes. Gently but thoroughly dry the ring using a soft, non-abrasive rag. For maintenance that does not require soaking, you can use a small makeup brush to clean your ring of dust.